Elena Polenova was a key figure in 19th-century Russia’s craft revival, but is little known in the UK. This winter, Watts Gallery has teamed up with the Polenov State Museum in Russia to bring work to Britain. We spoke to Nicholas Tromans about the exhibition and why Watts Gallery is the perfect place for it. The exhibition is the first major retrospective outside Russia to explore the career of the 19th-century Russian painter and designer, Elena Polenova. Showcasing furniture designed by Elena alongside her paintings of landscapes and folk-tale illustrations, the exhibition will demonstrate Polenova’s important role in the Russian craft revival of the 1880s. Elena Polenova was part of the generation of artists who rediscovered the folk traditions of the Moscow region – its wooden architecture, furniture and children’s toys; its icons and peasant decorations; and its vibrant tradition of folk stories and fairytales. Elena Polenova was the younger sister of one of Russia’s most famous artists, Vasily Polenov (1844–1927). During the 1870s and 1880s, Elena and Vasily spent time at Abramtsevo, an artistic colony located in a rural setting outside Moscow, that sought to recapture the quality and spirit of medieval Russian art. Watts Gallery has launched an international Artists’ Studio Museum Network, and the exhibition is the first in a series of partnerships which are growing out of that network. Although a big name in her home country, Polenova is not well known in the UK. Bringing this material over from a rural estate in Russia gives audiences here in England a unique opportunity to see into the romantic world of 19th-century artists’ colonies in the Russian countryside. The exhibition is a genuine Anglo-Russian partnership, with research pooled between scholars based both in Russia and the UK. One particularly interesting area of new research we have opened up is the passionate interest in Polenova on the part of some of her British female contemporaries. So we feel we are picking up the threads of an Anglo-Russian relationship that was sadly curtailed by Polenova’s early death at the end of the 1890s. One of Watts Gallery’s patrons, Kirsty Anson, wrote a university dissertation on the parallels between Elena Polenova and Mary Watts, the British designer who, along with her husband G. F. Watts, was the founder of Watts Gallery in 1904. The connections and echoes between our two institutions became clear and a relationship developed, leading to the idea of showing some of the Polenovo collection here at Compton in Surrey. The Arts & Crafts ethos of the works suits our architecture and location perfectly, as does the collaborative approach that Polenova is associated with: she and Mary Watts were both team-players in their attitude towards art and design projects. We often show the work of 19th-century women artists at Watts Gallery, and so the proposal for a Polenova exhibition made sense to us from many points of view. Different visitors will be delighted by different exhibits. But there is something particularly powerful about the furniture that Polenova designed for the carpentry workshops at Abramtsevo, of which we are showing several examples. The idea of taking folk traditions and turning them into art was a strong theme among artists – not to mention architects and musicians – around 1900. Polenova’s furniture is an especially powerful example of this trend. Her pieces are so homely and charming, redolent of a cosy cottage hidden away in a distant forest, and yet at the same time the shapes and decoration have all the boldness that we would expect from an exponent of modern design. Because of Polenova’s relatively early death, many of her book illustrations were left unpublished. 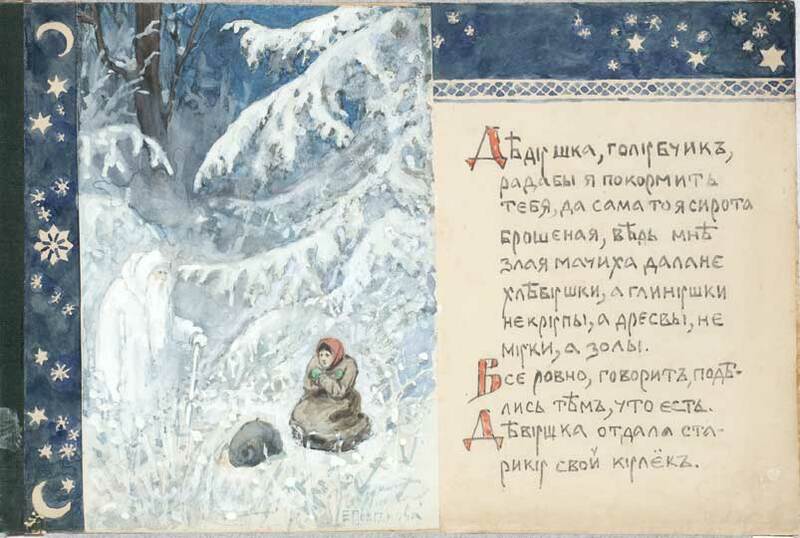 So it has been a real delight to discover the designs she made to illustrate Russian folk-tales (or fairytales as we usually say in English). These wonderful images allowed Polenova to indulge her passions for Russian landscape, architecture, folk traditions and wit all at the same time. She was very well aware of children’s book illustration in Western Europe and wanted to create something comparable for Russia. So having the chance to bring these works to a British public has been especially satisfying. Polenova is a key figure in the history of Russian art and design, and one of the great Russian women artists. But she is not yet a household name in Britain, where, understandably, other names such as Abramtsevo also require a lot of explanation. So we have worked hard to create an exhibition which undertakes to introduce some new places, ideas, histories and personalities to our audiences, while never losing sight of our mission to allow them also to really enjoy these works. We have lovely but modestly sized spaces at Watts Gallery. Our exhibitions do not have space to sprawl or meander. When we want to combine two-dimensional artworks with sculpture, film or archival material – as we often do – then we must take great care to ensure the rooms hold together in terms of overall impact. 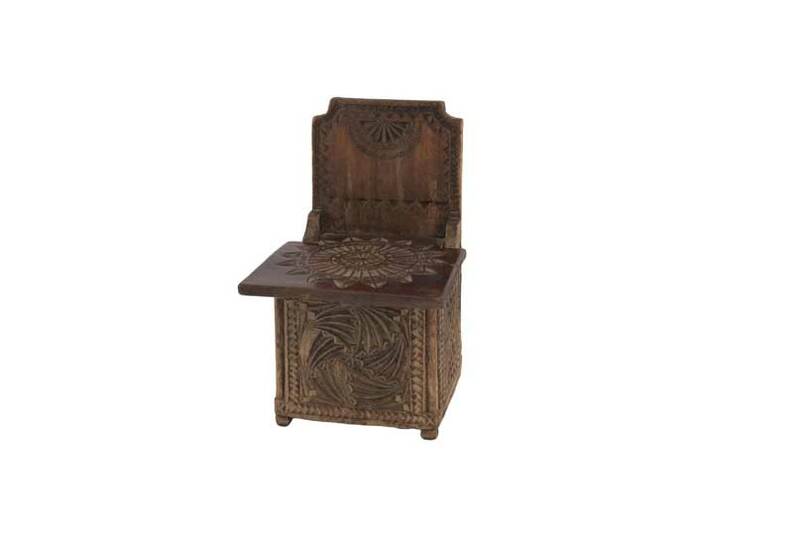 Polenova’s furniture, which is fragile, is displayed fixed to the walls or mounted on plinths to discourage visitors from trying to use it as it was originally intended, i.e. to prevent them sitting or leaning on it! So there is a strong sense of the whole space being used, with a domestic flavour given by the furniture and the icon – painted by Polenova in collaboration with her friend Aleksandr Golovin – which is placed, as was traditional, high in the left-hand corner of the main exhibition gallery. Our relationship with Polenovo was the basis for this exhibition and they are the generous lenders of all the exhibits. If we had had twice the space (and twice the budget) it would have been wonderful to borrow some more of Polenova’s pieces of furniture from the Abramtsevo Museum, along with her dramatic painting The Serpent (a Symbolist fantasia of Russian colour) also belonging to Abramtsevo. ‘A Russian Fairytale: The Art and Craft of Elena Polenova’ is at Watts Gallery from 18 November–8 February 2015.